Dramas convey the tradition and culture to next generations. There is a great importance of keeping dramas alive. Though there are many drama groups, Sri Venkateswara Natya Mandali (Surabhi) is unique. This is not an organization; This is a system which has travelled 75 years with discipline and dedication. Any other group can let live a play (drama) for some time; But this troupe makes the play eternal since this troupe is one family. The descendants inherit the Drama as their asset as well as the essence of life. For a Surabhi artist, Rangmanch (the stage) is the place of birth, Rangmanch is the responsibility to keep going on; Rangmanch is the school where the essence of life dwells, Rangmanch is the only meaning of the life. A Surabhi artist is an artist by birth. It quite understands if we know that most of the Surabhi artists brought on to the stage on their 11th day from birth to perform the role of infant-Krsna. They feel proud to have the opportunity to the babies to be brought on to the stage since it is the only noble life they know by heart. The set making or the molding work or the costume makings or the electrical work or any other task that’s related to the Surabhi drama are performed by the family. All the artists are technicians as well. There is no difference between the artists whether the artist playing a major role or a medium role; when the artist retire from the current seen, he/she would participate in the back-stage work to make out the next set of the scene. There was a good era that Surabhi family could lead the good economic life. But coping with the fast technologies such as Televisions, Cinemas; these days, it is not so easy to get the maintenances too. In 1996, Padmasri B.V.Karanth conducted three workshops for Surabhi with the contribution from NSD (Delhi), RRC (Banglore), Spandana (Banglore) and Alarippu (New Delhi). The intervention of Padmasi B.V.Karanthji made Surabhi to grow national. The Ministry of Culture, Govt. of Indian recognized the services of SVNM.Surabhi and providing the salaries for some Surabhi artists. This troupe went through three workshops from Padmasri B.V.Karanthji respectively ‘Bhisma’ in 1996, ‘Chandi Priya’ in 1997 and ‘Basti Devatha Yadamma’ in 1998. The first 120 years: All the past years, Surabhi lead the nomadic life and most of the years went in performing at villages. So, Surabhi was known for Andhra villages very well. But the economic conditions were poor enough to downsize the number of troupes from 60 to 5. And the education of the children was quite disturbed due to the nomadic life. The past seven years: When Dept. 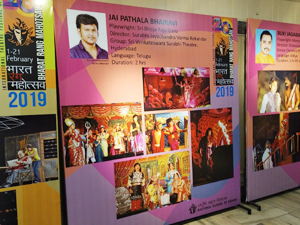 of Culture- Andhra Pradesh gave a chance to perform temporaryly, with a temporary stage in the heart of the city Hyderabad. In effect, the citizens, people of other states and foriegners habituated to watch the SVNM.Surabhi's performances. Which in effect gave good popularity to SVNM.Surabhi thus, Surabhi’s fame grew internationally. Not only that, the children of the SVNM.Surabhi family got the chance to perform on the stage without disturbing their education. There are kids who study the primary, secondary educations, and there are young people who are pursuing post graduations, and PhD’s., in Theatre Arts. In fact the 120 years of the popularity gained at villages is outsmarted by the past five years of popularity. This rapid popularity gave Surabhi new hopes to move forward. Now, there is a fearful thought that if Surabhi is to go back to the villages, it may loss its light and the existence will be in question. in effect, the people will not have the opportunity to experience the unique art. In order to let this system live, either the Govt. (of State as well as Central) or the other donors who are admirers of drama should come forward and make it happen that SVNM.Surabhi should have a permanent theatre in or around Hyderabad.